Earlier this month an amazing discovery was noted about the zigzag lines found on a piece of shell from Trinil, Indonesia, which suggest that they were made by our ancestors Homo erectus and in turn suggests that these hominids were capable of abstract thought. The discovery was announced in Nature. 1 June 2006 (Nature) – Stone tool finds beside hobbit suggest that they inherited tool-making tradition from homo erectus predecessors. The latest twist in the tale suggests that these one-metre-tall hominids, with a brain the size of a grapefruit, were the final members of a tool-making tradition stretching back more than 800,000 years. 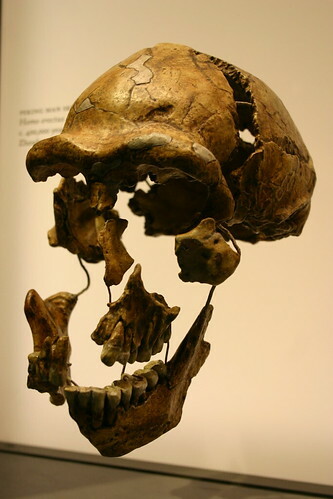 … a separate line of evidence points to H. floresiensis as a tool-maker. More than 500 stone blades found on Flores and dated to more than 700,000 years ago seem to have been made in the same way â€” by striking stones to chip off large flakes â€” as the more recent blades found with the hobbits.